Woody was at a shelter in Louisiana that has an open-admission policy, which means it accepts every pet, stray or otherwise, that is brought to it by animal control, relinquished by owners or dumped at its door anonymously. Such shelters usually suffer from overcrowding and underfunding. Unfortunately, euthanasia is one way to deal with this situation. A good many rescue groups and sanctuaries try to ease the burden at open-admission facilities by accepting some of their adoptable pets who are running out of time. Woody fell into this category. Workers at the Louisiana shelter saw what a good dog he was and arranged for his transport to Freedom Street Rescue. He was getting his second chance. Freedom Street posted Woody on Petfinder where Amy Thrasher saw the listing. The rescue is in Houston, but it also has foster homes in Colorado, where Amy lives. “When I saw Woody’s picture on Petfinder.com, there he was, smiling in amongst the grass and flowers. Not only did the caption say ‘Woody,’ but also ‘loyal companion’ and that just struck a chord,” she says. 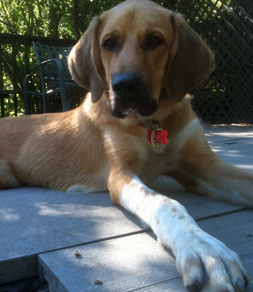 So Woody was getting his third chance – this time for a permanent home and a loving family. Woody “has a friendly approach to all new people and dogs he meets, and he has won our hearts over with his boundless love,” Amy says. He loves his family time when they go on walks or to the creek. Woody was lucky. Partnerships between open-admission shelters and rescue groups are stop gap measures that save thousands of pets like Woody each year. The longer term solution is to spay or neuter pets to prevent overpopulation and microchip and tag them to make it possible to find their original homes when they become lost. Through its FurKeeps program, Petfinder also provides families with advice to insure that a pet’s home is forever, which is what we all want.